Two shiny trailers with Estonian national TV logos blocked the entrance of the Athena conference centre last Friday. Obviously, something bigger than what Athena could accommodate was underway. The next, rainy morning close to a hundred remarkably young and enthusiastic people were buzzing with excitement, anticipating all those world-changing ideas and inspiring talks to which both global TED and local events like TEDxTartu usually treat their hungry audiences. After a while, the show began. The Director of the Estonian Genome Center, our Professor of Biotechnology Andres Metspalu, appeared high up on stage from behind the thick velvet curtains. He talked about personalized medicine in which gene data guides choices both in medical treatment and lifestyle. Pretty scary. Can we die healthy? These were my only thoughts before the magic professor Metspalu disappeared from stage. No questions were taken from the audience; it seemed like there wasn’t even time to raise a hand. And no, I didn’t feel like asking anything at that moment. Then the graphic designer Margus Tamm gave an introduction to what appeared to be the semiotics of poster art, accompanied by some cool examples. “The poster is a reference. The poster is a translation. The poster is a work of art.” Would you disagree? In a moment, a stunning lady in red was suddenly walking the stage. Legendary trainer of small entrepreneurs Marju Unt shared the personal, life-changing experience she underwent when it suddenly occurred to her that 40 bus-fulls of unemployed Estonian people stood behind the abstract number in the news. Unt talked about the beneficial and healing relationships between successful entrepreneurs, or “Jupiters” and their “Moons” (someone in the audience knew that Jupiter has 63 moons), or the unemployed. In her emotional presentation Unt also quoted Sirje Priimägi, who used to divide people into two: those who keep waiting for a party invitation and those who undertake to throw their own party. 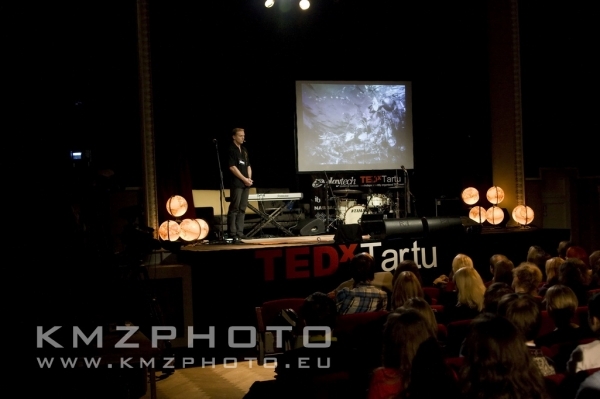 At this point I felt proud of the great TEDxTartu team, many of them the University of Tartu’s own students. EXTRAVAGANT MUSIC PERFORMANCE BY LIPPAJAD. TED TALK BY RORY SUTHERLAND. LUNCH. Then the director of our Institute of Technology, Erik Puura, confessed as to why he had started his science blog: “It was Christmas, I was sick and I wanted to have my say about the burial of Tallegg chickens that had died of Newcastle disease.” Puura noted the growing influence of science bloggers and warned listeners against the flourishing of pseudoscience. The session’s last and the day’s youngest speaker, Sandra Lillemaa from the “Young People to Schools” foundation, surprised everyone with her fresh vision of leadership. Sandra assured us that regardless of occupation, all people can be leaders in their lives – all they need is clear vision, passion, ethic maturity, trust and courage. TED TALK BY SIR KEN ROBINSON. SHARING BREAK. The last three speakers – two of whom presented themselves as a warm-up band for the well-known Estonian singer Liisi Koikson – were still to come. Our Professor of Macroeconomics Raul Eamets took the stage to promote an idea which was later promptly picked up by media although, as some people claim, it wasn’t anything new. Namely, Eamets proposed that Estonia should stop using cash entirely when it adopts the euro as the national currency in 2011 and thus become the world’s most transparent country. Of course, this would pose a challenge for the country’s IT sector, require consent on lowering bank transaction fees, and probably more (how about a more transparent society?). Then the Estonian ambassador to Russia at the time of the Bronze Soldier crisis in 2007, Marina Kaljurand, walked up to the stage carrying a textile souvenir bag. 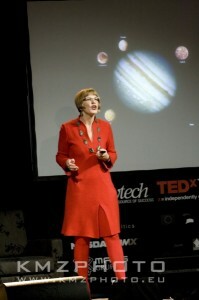 It looked a bit weird, but as the TED format prompts, it could have been intended to be part of her talk. Indeed, the bag was partly made by Afghan women as a part of Estonia’s development aid project in Afghanistan. Kaljurand discussed how to become a good donor country. She said that resources need to be concentrated on a small range of projects that aim to make a difference locally, even within a single Afghan province. The last, and probably the most awaited speaker was Rainer Nõlvak, the main organizer of the “Let’s Do It” campaign in which 50,000 volunteers collected 6,000 tons of trash all over Estonia within a single day in 2008. This action inspired other nations to follow, including Lithuania, Latvia, Slovenia, Portugal and others. Meanwhile, both the mission and ambition have grown to become the event known as World Cleanup 2012. Nõlvak delivered his talk in English. Moreover, he did not seem to address the participants, nor the bigger audience behind the Estonian TV and computer screens. So who was he talking to? Was he at the global TED stage in his dreams? Who knows? Liisi Koikson was the last person to take the stage and concluded the inspiring day full of ideas in her own mild and melodic way. 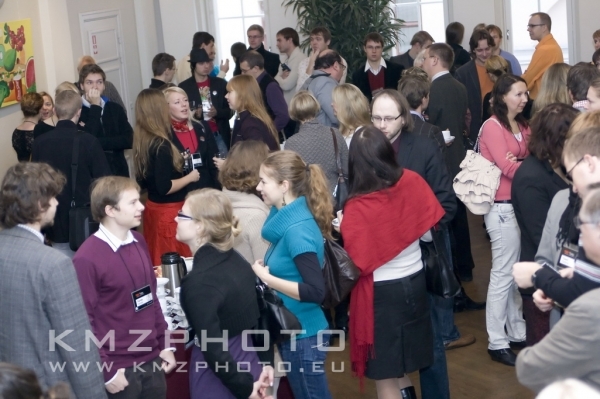 This entry was posted in Events, Tartu and tagged ideas, inspiration, Tartu, TEDx, TEDxTartu. Bookmark the permalink.